We knew it was coming. 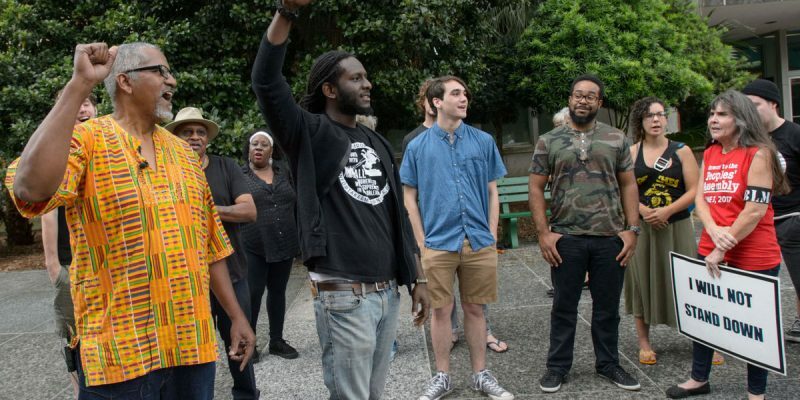 The organization with communist leanings, Take ‘Em Down NOLA, is now demanding the removal of all New Orleans monuments linked to slave owners and the Confederacy. Every last one of them. The sanitize history movement empowered in its early stages by (Hey look at me, I’m a presidential candidate) Mitch Landrieu, has gained momentum nationally. Take ‘Em Down NOLA’s Malcolm Suber obviously sees this and is now going in for the kill in the Crescent City. He wants them all down. Suber held a news conference Thursday in front of City Hall to make his demands. The big question is will Mitch Landrieu have his back on this. When Suber made his demands in 2015 Mr. Landrieu was all, sir, yes sir. Landrieu’s capitulation to Suber’s rewriting of history led to the removal of statues of Gen. Robert E. Lee, Gen. P.G.T. Beauregard, Confederate President Jefferson Davis and the Battle of Liberty Place obelisk. So where does this sanitize history movement end? Will the left eventually demand all monuments, statues, buildings, or streets named after leaders who offend their sensibilities be removed? George Washington owned slaves. Should we take a bulldozer to the Washington Monument? What about former Democrat Robert Byrd. There are several things in his home state of West Virginia named after the former KKK recruiter. I doubt the left will go after him since he’s one of their own. What about Martin Luther King Jr. Should we do away with all the MLK streets across America? Writing an advice column for Ebony magazine, Dr. King was once asked by a young gay man for guidance. He didn’t give the politically correct answer. “I would suggest that you see a good psychiatrist who can assist you in bringing to the forefront of conscience all of those experiences and circumstances that led to the habit. You are already on the right road toward a solution, since you honestly recognize the problem and have a desire to solve it.” Dr. Martin Luther King Jr. Homosexuality a problem? Time for us to end the MLK holiday, right my left leaning friends? Of course, the left would never touch this. They are selective, inconsistent, and hypocritical with their purging of history. Take ‘Em Down NOLA and other anti-America groups are energized and ready to advance their cause of bleaching, sanitizing, spinning our nation’s history into something it is not. But since when has the left had an ounce of regard for the truth? Dan Fagan is a former television news reporter, journalism professor, newspaper columnist, and radio talk show host. He grew up in New Orleans and currently lives there. He is a regular contributor for The Hayride. If you have a news tip for Mr. Fagan you can reach him at [email protected] or 504-458-2542.